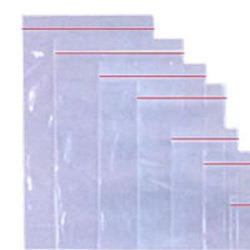 Our reclosable bags are made of virgin polyethylene and meet requirements. Each bag features a prime quality zip that will protect its contents. You'll find a bag for every conceivable use. Just choose the bag that fits your needs, and we'll ship it out to you right away. Complying with the highest international standards and norms, we have carved a niche in this cut throat industry. Based in Jaipur (The Pink City), India, we have been striving to ascertain balanced operations and follow innovative strategies. This has further helped us in strengthening our company's foundation. Widely acknowledged as a reputed Manufacturer, Exporter, Importer, Trader, and Supplier, we are committed to offer impeccable quality products. Our wide assortment of Packaging Materials is used in various industrial segments for packing purpose. To achieve the maximum level of client satisfaction, we always strive to bring forth flawless range of products. It is the unwavering efforts and dedication of our team that has enabled us to win the trust of our valued customers. All our products are manufactured by using only premium grade raw materials, procured from trustworthy manufacturers. We have set up a robust infrastructural facility comprising latest production, quality checking, R&D, warehousing and other facilities. Our product team makes sure that the manufacturing machines are upgraded time to time so that we remain in sync with the technological advancements. Meeting the ever growing demands of our valuable customers, we are a name to reckon with. Our company boasts off a robustly constructed infrastructural facility spreading across a large area of land. Our modern manufacturing unit is well equipped with all the latest machinery, advance tools and equipment. These facilitate smooth flow of work as well as timely completion of the clients' order. We have recruited dexterous professionals who have years of experience and are well versed with technological advancements. Owing to their dedicated efforts and commitment, we have developed core competency in developing quality Packaging Materials. We, "Arihant Agencies", established in the year 1990, is an immaculate manufacturer and supplier of a superlative quality range of Packaging Materials and Accessories. Holding great expertise we always try to maintain high quality standards in our provided product range that includes Packaging Tapes, Wrapping Films and Polythene Rolls. Serving the nationwide clients, we pay utmost attention to the quality of our products that is processed at our state-of-the-art infrastructural unit. The credit of our success we give to our hard working personnel that work day and night in order to fulfill the bulk requirements of our clients. Also, from our end these products are offered at cost effective prices which is done only for the benefits of our valued clients. In this highly competitive industry, we have achieved a huge clientele across the nation by consistently offering sustainable solutions on timely basis. Additionally, our production base comprises all the modern facilities as well as only proficient team members are hired by us that helps us in meeting the production standards. Apart this, all the products packed properly in tamper proof packaging so that each product remain safe from all sort of defects. Also, to maximize our team efficiency we provide them timely training about the latest trends of industry, so as to keep them abreast with the latest norms.